Quiverwing in animated style...on the days she feels like wearing glasses instead of contacts. Quiverwing is an artist, occasional author and co-administrator of the Paperpusher's Message Board. Quiverwing has a degree in economics and is currently a full-time consultant. A Daria fan since the initial airings on MTV, Quiverwing began following Daria fandom in 1999-2000, but she would not become an active member until 2004. In 2005, Kara Wild appointed Quiverwing as a full moderator for the PPMB, as well as a special moderator for the Other Languages forum. When Wild stepped down from active moderating of the PPMB in August, 2007, she appointed Quiverwing as a permanent administrator in her stead. In September 2009, Quiverwing created the In the Spotlight feature, a series of threads allowing forum members to learn more about each other via interview-like questions. A cartoon illustrator since childhood, Quiverwing’s first excursion into Daria fanart was for the All My Children series. Her preference for canon-style presented her with a challenge: to make the characters look younger, but recognisable enough to maintain their canon appearances. University commitments and lack of inspiration kept Quiverwing away from drawing until early 2010. Since then, she has only provided artwork for popular fanfic series. Apart from the PPMB, Quiverwing is a sysop on the Daria Wiki. 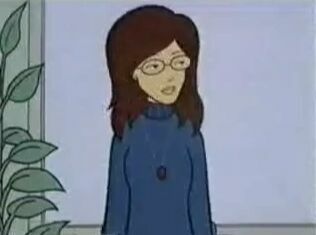 She was a contributor to the Daria Fandom Blog II, Lawndale Online, Daria Blandom Blog. Quiverwing was part of the Daria Fanworks Awards staff from 2005 to 2013. In addition, she oversaw the 2005 Crappies, with Lobinske and Wild. NightGoblyn's Lawndale's Finest: The Dark Knight (2009). InvisibleDan's My Wings Are All A-Quiver, a Quiverwing/Tom Sloane shipper fic (2010). She also participated as a contestant in Celebrity Jeopardy: Daria Edition in early 2006. This page was last edited on 28 October 2016, at 01:56.